In June 2013, Greens Minister Rattenbury approved the massacre of 1,455 adult kangaroos (excluding pouch young) in Canberra's so-called Nature Reserves. However since then two protest groups - Animal Liberation ACT and the Australian Society for Kangaroos - launched urgent legal action to stay the seven cull licenses in the ACT Civil and Administrative Tribunal. They wanted the culls delayed by the tribunal until a full review of the government's decision occurred, and said they would be at a significant disadvantage if a stay was not granted. Unfortunately, the protest groups lost and a total of 1244 kangaroos were approved to be massacred in seven Nature Reserve Parks. What kind of political party would have a policy to 'protect native wildlife' and 'ensure that animals' rights and welfare are respected' then go ahead and authorise a bloody massacre of native animals? And it gets worse. For every adult female there is one in-pouch joey and one at foot joey, both dependent on her for 18 months. When she is shot, the pouch young is yanked from her pouch and bashed to death while fully conscious without anesthesia. The at-foot joey will hop away only to die of hunger, predation, hypothermia and a broken heart. In view of how pouch young are despatched, how can the Greens justify this when their policy clearly says 'humans have a duty of care to minimise physical and psychological suffering of animals resulting from human activity'? Where are the strong animal welfare standards when it comes to kangaroo killing? Non-existent obviously. had an exceptional strike rate of more than 99 per cent for hitting their target the first time. It's extremely unlikely that these shooters would get such a high rate of head shots considering they are shooting at night at moving targets. In fact the RSPCA claims that at least 40% only are not head shots, meaning their face gets blown off and they are still alive or they are body shot and still hop away. If anyone killed a puppy or kitten like this it would be an offence. Our kangaroo killing is every bit as bad as Canada’s seal hunt. Shame on Australia! There is currently no evidence of overgrazing, soil loss or threats to other species, but ACT bureaucrats want to spend taxpayers’ money to ‘cull’ in case next year kangaroos breed up. There isn’t any! It all looks very clinical, official and correct. We need to see through this veneer of ‘correctness’ to the cold-hearted brutality masked by pseudo-science. If you believe the 'science' that kangaroos are overpopulated in these reserves (unproved) and if you believe their population estimates (always hyper-inflated) and if you believe kangaroos are impacting other species (also unproved) in spite of millions of years of living in harmony with other species, then where are the wildlife corridors for them to move on? Why have the Greens not even considered the need for these in view of their policy to protect native wildlife? Relocation is a viable option that is actually cheaper than shooting and many local and experienced wildlife carers would happily assist, however, the Greens appear to not even consider such an option. When I called Rattenbury's office last month I was told that relocation was not an option because of the high number of deaths. Even if that were true, why do they prefer 100% deaths to a lesser number of deaths? As it turns out Professor Steve Garlick and his wife Rosemary Garlick presented a paper in Adelaide showing 0% deaths in their relocation of 700 kangaroos over the years. Why aren't they being consulted by the Greens? I am appalled at the recent announcement (at the last hour) from the Government to kill healthy Eastern grey kangaroos in Canberra national parks. This is NOT a cull, since these are healthy animals! This is the most underhanded and disgustingly corrupt display of authoritarianism, which seems typical of the way in which this Government works, without any consideration or input from the people who elected them. If this planned slaughter of healthy animals was based on scientific evidence, why isn't this evidence published for public comment? 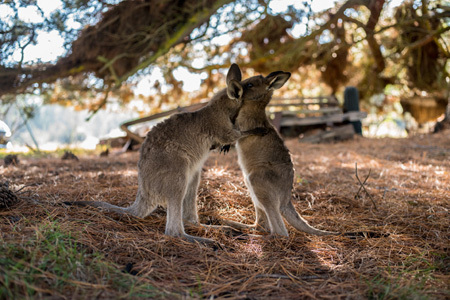 How is it that healthy, native animals can be slaughtered without any statistics of the numbers of kangaroos present in the Canberra Parks which covers approximately 50 square kilometres? WHO has carried out a count of these animals? Why hasn't the numbers of kangaroos been published for the public to see? Last year Mr. Iglesias stated that that, "kangaroos have evolved the ability to quickly take advantage of good conditions"? Kangaroos cannot change their breeding cycle, which remains the same whether conditions are good or bad. Eastern greys have a gestation period of 36 days, it takes 18 months to 2 years for a joey to wean from its mother, reaching sexual maturity between 24 and 36 months; NOTHING can change the physiological development of a kangaroo. What excuse is being used this year? Are the authorities aware that kangaroos are an extremely vital aspect of their eco-system, providing all these benefits for mankind? Kangaroos provide a natural fertilization of soil via their faeces. Kangaroo dung promotes nature's soil purifiers, the dung beetles. Dung beetles bury and consume dung, improving nutrient recycling and soil structure. The uptake of nitrogen, phosphorous and sulphur in plants was over 80% greater in soils where dung beetles were active compared to those where they were not. Tunneling dung beetles also assist root penetration and improve water infiltration to the soil, thereby reducing run-off. Kangaroos provide dispersal of grass seeds to ensure the environment remains in a healthy state. They provide a natural fire prevention by keeping grasses short and preventing understorey kindle that dry out and feed catastrophic bush fires. I wonder does Mr. Iglesias know that a healthy mob of Grey kangaroos should consist of up to or more than 300 animals? To state that there are 'too many' is comparable to standing on the great plains of Africa and stating that the herds of herbivores on their annual move to greener pastures is a 'plague! What authorities are obviously not aware of is that Grey kangaroos are the most social of the macropod species and when one of their mob is killed, the effect on an individual can also lead to death, since their bond is so strong. They are only as strong as the number in their mob, the smaller the mob, the less strength of the individuals. The out-of-pouch joeys usually take off in fright when their mother is shot, only to die a very slow and painful death due to starvation and the psychological deprivation of being apart from its maternal mother. Kangaroos have lived in the Australian ecology for 50 million years and are quite capable of stabilizing their own numbers without any interference from us. Canberra is emulating a red-neck society, with absolutely NO understanding of the ecology of the natural environment, nor the animals that exist in its diversity. If your offices intend to send me the standard reply relating to the killing of healthy kangaroos, don't bother. For once in your entire political and business related lives, could you please answer the above questions. While the ACT is quick to blame kangaroos for environmental problems, they forget that it is humans who create the most devastation to the environment (construction, deforestation, roads, livestock farming, barbed wire fences, chemical sprays). Kangaroos, on the other hand, benefit the ecosystem in many ways (as described in the above letter from Lynda Staker). Therefore, the more kangaroos, the healthier the ecosystem! Conversely, the more humans the more unhealthy the ecosystem since humans provide no ecosystem services. The Greens have shown their true colours as a hypocritical party not worthy of trust. Luckily for wildlife lovers there is a better choice this September - the Animal Justice Party. AJP will keep their word to protect wildlife. See http://www.animaljusticeparty.org.au . Kangaroo killing is animal brutality at its worst. The Greens have never really taken an interest in animals. They didn’t even attend the last protest meeting in Canberra on the live trade where AJP President Steve Garlick was the only political party speaker. The government is hiding behind the language used for conservation, ie greenwashing, to support this "cull" of "overpopulated" kangaroos on nature reserves in Canberra. While Japan's whalers have been accused by Australia, in the International Court of Justice, of doing commercial whaling using the "lab coat of science", politicians in Canberra are doing similarly with kangaroos- of using junk science to justify the slaughter of wildlife. Whether there is one, or 4 or 5, kangaroos per hectare is splitting hairs and using questionable science to justify the killings. There's no empirical evidence that kangaroos are as environmentally destructive and threatening as vermin or feral pests. They are soft-footed native animals, evolved especially to be endemic to Australia. Ironically, it's World Population Day today, July 11th, and if there are any environmental threats to Australia, and ongoing damage being done to our natural heritage, then our own human overpopulation should be examined, not that of kangaroos! Threatening processes are caused by detrimental habitat loss and changes, overgrazing - mainly by heavy-footed livestock- and introduced species. There's no valid documented evidence of any threats to native flora and fauna from kangaroos. What's more likely is that this killing is to do with traffic accidents and insurance claims with regards to kangaroos on the road. It's a more mundane and monetary-based explanation for the killings, so the Canberra government should stop hiding behind junk science, and their vilification of kangaroos, in their support of the massacre. There was never going to be justice or independent evaluation of the kangaroos' impacts on ecology coming from the court in Canberra. Their own government ecologist (D. Fletcher) was agreeing with the "cull", and supporting it - even using his own studies to support his arguments! By definition, a government-appointed ecologists have no independence or detachment. He's bound to his employer - the ACT government - and wouldn't have been employed in the first place unless his focus was anthropocentric and government-centric. These kangaroo courts are an example of how our native animals are meant to now justify their existence, and not for profit groups are left to their own funds and effort to defend these native animals, kangaroos, against unjustified accusations of being in overpopulated proportions, of being environmental threats, and overgrazing! Native animals shouldn't have to justify their existence! It's absurd, cruel and full of hidden agendas. It's easy now to cloud economic arguments in pseudo-science to distract the public and make things look orderly and logical when they aren't! Maybe this article should be re-titled, "Greens Party Cruelty". Hypocrisy seems the lesser of the evils.